For the first time, the 26th ISTO World Congress will be held in a Balkan Country which earned an important position in European Tourism, namely Croatia. It is with great pleasure that we invite you to join us in Zagreb from 18 to 21 October 2016. This Congress will be a direct continuation of the previous edition, held in São Paulo, as it will be the outcome of the decisions initiated since: on the one hand to open the scope of actions of ISTO and secondly, to strengthen the Organisation to serve its members with a more dynamic vision of Social Tourism. This is an important challenge. During these days, when the General Meeting will be held but also sectorial or regional meetings and the thematic sessions of the Congress itself, we will try to discuss the link between inclusion and tourism and see how the one is a vector of development for the other. But just like its forerunners,we also expect this conference to be a time of interesting exchanges, encounters and conviviality. Whether you are ISTO member or not, tourism stakeholder, public authority, trade union or social organisation, university, … and most of all interested in social, solidarity and responsible tourism, we hope to see you in Zagreb, where you will also have the opportunity to discover the beautiful country Croatia! 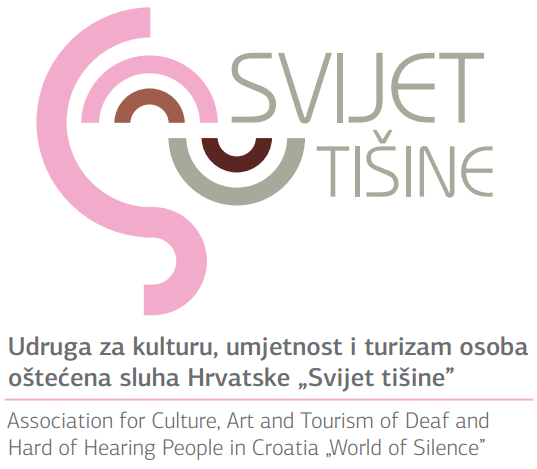 The Croatian Association for the Culture of Deaf and Hard of Hearing People "World of Silence" is a co-organiser of the ISTO World Congress 2016. The Association was founded in April 2006 by Vanda Šagovac who is also president of the Association, with the aim of promoting the culture of hearing impaired persons in Croatia. Through our work we want to remove the social barriers faced by deaf people, by organizing various activities to try to motivate our members for artistic expression, and with the organization of various events and exhibitions we want to educate and sensitize the public about our needs, and more, because behind the concept of culture of hearing impaired persons is not only art, but everything that makes it the culture and customs of a nation. We hope you can join us and help us to promote the status of Deaf and Hard of Hearing People in toursim. President of the NGO "World of Silence"